The Aosta Valley, perfectly located at the crossroads of France, Switzerland and Italy, within easy reach, and in the shadow of the magnificent Mont Blanc, is absolutely one of your best choices for short-distance ski holidays. Valle d’Aosta could be described as the Rome of the Alps. The Aosta Valley (Italian:Valle d'Aosta, French: Vallée d'Aoste or Val-d'Aoste) is a mountainous region in north-western Italy. It is bordered by France to the west, Switzerland to the north and the region of Piedmont to the south and east. With an area of some 3.263 km² and a population of about 120,000, it is the smallest, least populous, and least densely populated region of Italy. It is the only Italian region which has no provinces (provincial administrative functions are provided by the regional government, the province being dissolved in 1945), and is divided into 74 comunes. The region has 2 official languages: Italian and French, and the majority of the local population also speaks “Patois”, a French-Provincial dialect. Some of the comunes, concentrated in the valley bottomlands, are purely French speaking and in the Lys Valley is a minority speaking Walser German. The regional capital is Aosta. With a total of 753 km prepared skislopes, the skistations of Breuil-Cervinia, Monterosa Ski, Courmayeur, La Thuile and others offer variety and challenges to skiers of all levels. Whether beginner or accomplished ski-specialist, there is something for all colors. Whether you ski the blue, the red, or the black slopes, you will find it here in abundance. Snow is guaranteed thanks to the sophisticated infrastructure of the region ! For the accomplished skiers, a lot of challenges can be found here: how about a 22 km descent with a denivelation of 2200 meters from Piccolo Cervino to the village of Valtournenche? Or ski all the way down from Punta Helbronner at 3462 meters to Chamonix (France) at 1037 meters, a 24 km trip that makes its way from the very heart of the Mont Blanc Massif along the Mer de Glace glacier? Want it even more adventurous? Then try heliski! The chopper takes you all the way up on the mountain where the view will take your breath away, even before starting your descent through deep snow! Besides its fantastic ski facilities, the Aosta Valley has the advantage of being within easy reach. For instance from Brussels it will take you 7-8 hours by car or by bus (+/- 900 km) the trip ending with the 11 km long Mont Blanc tunnel, an experience in its own right! If you prefer to fly there are many possibilities. SN Brussels Airlines for instance offers seven flights a day from Brussel to Geneva, and 2 per day to Torino, a morning and evening flight. 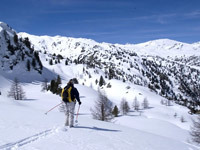 This way one can easily enjoy 3 full days in the Aosta Valley. 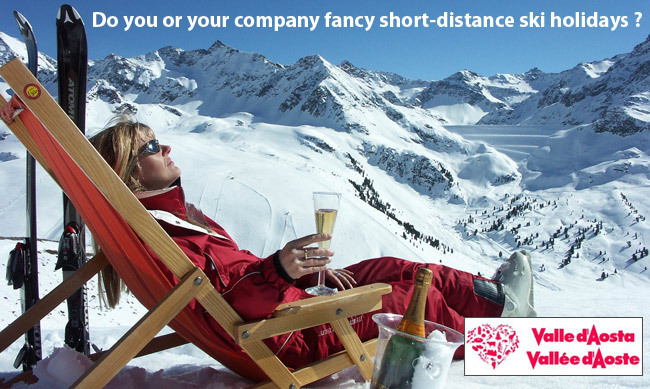 Imagine yourself leaving Brussels and 3,5 hours later you are already on the slopes! Also Easyjet flies to Geneva and Ryanair offers flights to Torino and Bergamo. In winter, there is a regular bus-connection with the Aosta Valley skistations from Milan, Torino, Bergamo and Geneva. In the Aosta Valley you will not find the 5-starred “Chain” hotels (fortunately ?). On the contrary, you will have a choice of numerous family-owned hotels with very personalized and friendly service, ranging from 10 to 50 rooms, and which can all be privatized. (www.hotelmontblanc.it), with a fantastic fitness and wellness complex. The Aosta Valley region is famous for its local products (mocetta, ham, sausages, cheeses, grappa), and boasts some award winning wines from the highest vineyards in Europe, like Blanc de Morgex and de La Salle. Gastronomy is therefore high on the region’s advantage-list, and you would be surprised of the quality food one can get in the cozy mountain restaurants and pubs (how about pasta with fontina cheese?). Non-skiers will most certainly not get bored in this region. A diversity of individual and group-activities can be organized, like cross-country skiing in Cogne or Val Feret, horse-carriage rides through the valley, snowscooter expeditions, wine tasting, walking trips on snowshoes, or a visit to the cultural capital Aosta. A number of wellness and fitness centers and spa’s are available throughout the valley. Take for instance the Pré St. Didier wellness center, enjoy the large scale of facilities, warm springs outside withmountain view! As the Aosta Valley is the preferred playground of the Milanese elite, all fashionable brands are represented so you can also “shop till you drop”. One of the specialists for this region is most definitely the AD HOC Company, located near Brussels. They know every hotel, every restaurant, and – more important – every skislope in the area. Their contact: Ad Hoc Company n.v./s.a. 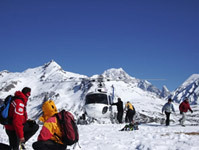 www.lovevda.it is the official website of the Aosta Valley. Feel like discovering Valle d'Aosta? More info on this destination?